The first meeting in the first class of lunar new year, VJU students and the Rector Furuta Motoo met up in a friendly atmosphere with full of laughter. This is the 3rd spring, marking the 3rd master’ program intake that has entered and studied at the university. For the 3rd year students, this is the first spring, the first Tet at VJU of themselves. For many VJU students, choosing VJU to be a place to study and experience for 2 years comes from different stories and leave very different impressions within individuals. Sharing in the meeting with the Rector at the first day of school, Hoang Duc Trung, student of the 3rd Intake of Master’s Program in Business Administration thanked the Rector, the Rectorate Board, the lecturers and all the staffs working at the school, who are in the eyes of Trung, have directly created the best learning environment for the students. 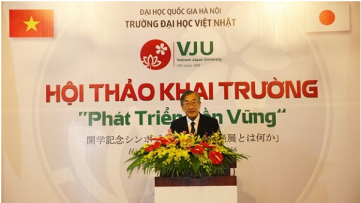 With Trung, VJU is a place where students, especially Trung, find their dreams and pursue it, where everyone together creates a university of goodness and towards sustainable values. On the side of the school, the Rector Furuta Motoo sent a new-year wish to all students. The Rector wishes that the students always have a broad vision and pursue a great ambition to contribute new values ​​to the whole society.